...card is what I was striving for today. I wanted a card to replenish my stash that had an all occasion type of sentiment and image. I have had this particular stamp, Large Flower Background cg403 from Hero Arts for some time now and really liked it immediately although now is the first time I have had to ink it up. I have seen some amazing cards out there in blog land using this stamp and was anxious to try using it myself. I love the colors of pink, rose and red with kraft paper. I decided to "tone" down the pink patterned paper by overlaying some vellum onto it. This is a somewhat "go to" style of mine.....I feel like I am able to use patterned paper and then also stamp a sentiment with out having to add a sentiment tag or banner. I also usually like how it looks with a colored image.....sometimes the colors don't always go together as well as I like and vellum is my method of "crafty concealer" for when I need to blend imperfections. Anyways, I hope you like! On another note, life has been goooood and super busy lately. Busy in a really positive way. Wisconsin has, until today and yesterday, had really lovely weather. It has inspired me to to be out and about and neglecting my crafting. Which is okay as I have felt the void of crafting filled instead with springtime breezes and warm sunshine ;-D My husband and I also took last weekend to go visit our oldest in Minn. She has take a new job an so we went and saw her new office, the new condo she will be living in soon and to just generally treat her like an "only child" which she hasn't been since her sister and brother were born! And it was fun.....we shopped, had coffees outside, drinks on downtown Minneapolis rooftops and just generally a wonderful time together. It is so different when your child becomes a "grown up" and you begin to relate to them as both your child and as this very interesting young adult. I like this stage so far ;-) I hope to get a few more cards up.....I have lots of images colored (love the coloring part!!!!) but not too many of these images have made their way into assembled cards. That is surely my downfall.....the card assembling part! Ooo, that was a fun post because I can so relate to your fun time with your daughter. My sons are in their 30's, but still love alone time with each one. 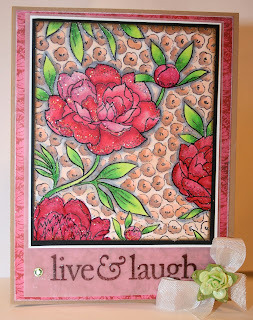 Hi Sheila, This is one stunning card :) I am so in love with this stamp! Sounds like time with your daughter was so much fun! So glad you are enjoying the blessings of motherhood, Sheila. This (long-awaited) card is stunning - I' not sure what "imperfections" you want to hide - it is perfect! Love the colors and the use of patterned paper. Hugs! This card is just lovely, Sheila! I think vellum is wonderful, too. Sounds like a great time with your daughter. Sheila your card is stunning! Love the colors on it too! Hi Sheila! Beautiful to see this gorgeously colored card from you today! Yes, Spring is just wonderful and should be totally exploited! So glad that you could spend some time with you daughter, it sounds like it was really an enjoyable time! 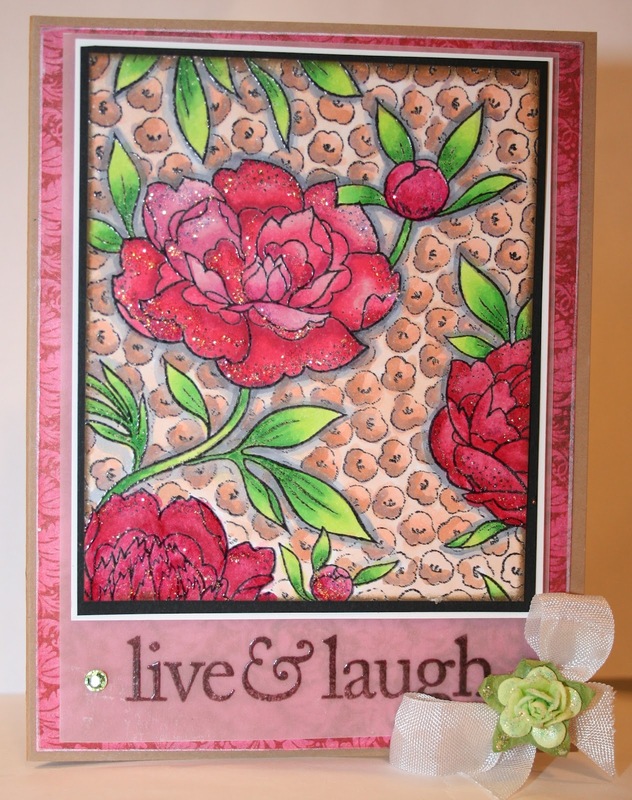 The vellum overlay is fabulous Sheila! Love the extra design layer it gives the card.